It’s good to be good, so the saying goes, and there’s an increasing body of evidence and research demonstrating that companies that treat employees well aren’t just “nice” – they reap financial and performance rewards. 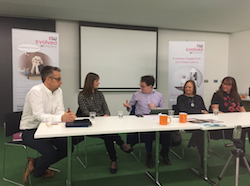 And today’s radio show, broadcast this morning on Sheffield Live and available below as a podcast, is a panel discussion I chaired as a MADE Festival Fringe event, all about employee engagement and support. The show features four excellent panelists with huge amounts of expertise and experience in running successful businesses and engaging and empowering their employees. We cover leadership, taking responsibility, accountability, motivation, support, whether tech is an enabler or encroaches on people’s time, how investment into (and management buyouts of) businesses affect performance, and creating a successful, positive culture at work. Have a listen to the podcast to learn from our panelists’ experiences and insights – with tips you can put into place into your business, whether large or small. Anne Wilson, managing director, Numill Engineering. Awarded the MBE for her services to the engineering industry and in recognition of her commitment to training and developing her employees, Anne Wilson started at Numill as a bookkeeper in 2000, before leading a buyout of the business in 2006, saving it from the recession and developing its overseas exports. Marie Cooper, winner of “Business Person of the Year” at the 2015 Sheffield Business Awards. Marie is the former finance director at President Engineering group which was formed after an MBO in 2010. Marie became Plant Manager after the sale of the business to Parker Hanifin last year, the business has won numerous awards including the Queen’s Award for International Trade as well as scooping three Sheffield Business Awards in 2015, with judges particularly praising Marie for her leadership skills. Neil Loadman, director, Evolved Workplace. Neil has a successful track record of delivering engagement, change and leadership projects in the HR arena within the food manufacturing sector. He has held senior/ director level positions, most recently at Kettle Foods. Whilst at Kettle Foods, Neil introduced the use of culture and employee engagement surveys as a diagnostic tool. Using the results of these surveys to inform HR strategy he sponsored interventions that focused on developing the vison, values and mission of the Company and introduced a development programme designed to transform the culture and leadership skills of senior managers. Hope you enjoy the programme, if so you can share it using the links below.